Every member of our team is committed to providing you with the very best in dental care and we are delighted to offer dental membership to our preventive practice that enables us to provide you with the treatment and support that best suits your needs. Membership plans are paid for monthly by direct debit and provide an excellent way of covering the costs of your routine dental and hygiene care. Research shows that dental care plans are the single most effective way of maintaining good dental health. Our most popular dental care plan costs £12.97 a month and includes two dental health assessments and two twenty minute dental hygiene appointments a year, plus discounts of around 20% off many of our treatments and worldwide dental trauma insurance. Instead of joining a monthly dental care plan, patients may choose to pay for their appointments and treatment as and when they need it. Full details available from our receptionists. Every patient is different and hence the fees will reflect your individual requirements. 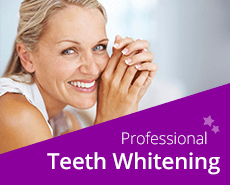 At the start of each course of treatment we will provide you with an estimate of the costs. Please click here to see our fee guide. Worried about taking the first step towards a more confident smile, then why don’t you spread the cost of your dental treatment over 10 months with our interest free finance? For example, a standard crown would be £59.6 per month or a stronger all-ceramic Emax crown would cost around £76 a month over 10 months. 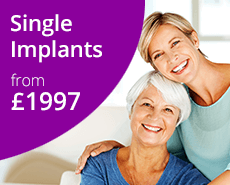 For larger and more complex treatment plans priced at more than £1,500, other finance terms are available, meaning dental implant placement could cost just £69 a month over three years. Please call us for details. Our fees reflect the time that we spend on you, the further training we have received, the investment that we make in our practice as well as the service we deliver. 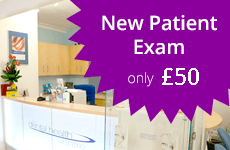 I would encourage anyone who wants an excellent dentist to have a look at what The Dental Health Centre has to offer. Absolutely everything is 10 out of 10!